Luckily Fr. Z‘s massive vote count has helped me give up in bitter defeat overcome the temptation to desire worldly blogging acclaim. I heard that the Catholic New Media Celebration is going to be in San Antonio in June this year. I’m there! 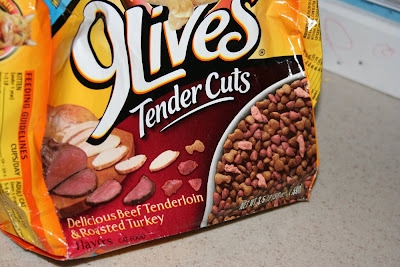 Maybe my little cat food connoisseur could explain the connection. My 32nd birthday is Monday. One thing about having four children in five years is that it makes 32 sound so young. I feel like I’ve been so busy in the past few years that I should be turning 92! In part due to my friend Abigail’s inspiring thoughts on attending daily Mass with her three young children, I went to daily Mass today at noon. I was so pleasantly surprised to see that there were about 150 – 200 other people there, especially considering that it’s not a major feast day, the other area parishes also offer daily Masses, and this isn’t the only Mass today. Even though I felt like I “didn’t have time, ” I’m very glad I went. I was going to write more but the girls are here and anxious to tell me about their days, so that’s it for now. « How to get started with adoption? Haha! First link, first comment, woohoo! That’s what happened when you’re up until absurd hours crocheting scarves. Isn’t that what everyone does at 1 am? Okay, I forgot about comment moderation. Maybe I wasn’t the first comment after all. Maybe Jen’s just sleeping at 1 am, like, oh, everyone else in the world. Chewbacca on trap set? Y’know, I do feel strangely free, now that all my dreams and goals have been placed in a strange perspective. We are almost the exact same age! I will be 32 on the 31st. I love your relationship with “the girls”. How fun. Oh my gosh, #3 and #7 had me laughing out loud this morning. And I wish I understood Twitter. I lurk around, trying to figure it out, but I just don’t get it. Can you explain how you use it in some future post? I heard that about the CNMC, too, and I’m bummed because I doubt with a 3-month-old baby, tight budget, and my husband’s work schedule in June (he’ll be working nights again like I mention in my quick takes), I’ll be able to swing it. It was on home turf last year, so I was there and it was so uplifting and informative. Plus, I absolutely loved meeting some of my fave Catholic bloggers. Would love to meet you someday. Daily mass with kids has been something I’ve struggled with. I used to try and go more, but I found myself getting really frazzled with my youngest who screams (shouts of joy, but screams nonetheless) through the entire service. Most people were kind, but I always seemed to get a few nasty looks. I need to thicken my skin and get back there. I just have to say over and over again how much I love this blog. That picture is beyond awesome! LOL! I love the awesome poster! #7 is so, so, true. Thank you! I love your takes. You’re hilarious. I did my 7 takes for the first time and I LOVED it. This is such a great idea. Thank you! Hi. Came over from Heather’s. Love your blog. No wonder you are winning things. I also love this theme and may jump in next Friday. Thanks for starting this meme! I enjoy filling it out, thinking about it during the week, and reading others’ posts. We also had four children in five years. Whew! I started having kids at 32 and finished having #4/5 at 34, so you’re quite a bit ahead of me! I’m starting to really enjoy Quick Takes Fridays, even if I don’t play every week. May God grant you many years in peace, health and happiness. I did it! My first Quick Takes Friday because I finally just decided to get on and make a blog and thank WordPress it made it easy. 🙂 Use a different SN at my own blog – theRosyGardener. 🙂 Thanks for this great idea, Jen! 😀 I think I even got the linkback right and everything! Finally, I’m back on my quick takes. Due to holidays, sickness, general apathy, I’ve fallen behind. So glad you keep your’s going no matter what! It always makes my Fridays better! Daily mass is very tough with little ones, but I say keep trying! The benefits you will reap will be tremendous. Eventually they get used to going and don’t act up EVERY time, maybe only every OTHER time! Your modesty (and probably a concious effort to avoid the sin of pride) have prevented you from engaging in any self-promotion with respect to the Weblog Awards. This blog is not only a joy to read, but it also has caused me to delve more deeply into my faith, which I too often take for granted. Perhaps you feel the same way. More importantly, taken as a whole (comments included), this blog is a fairly impressive body of work, and many of the posts are truly penetrating. I believe that the approach Jennifer takes in her writing — humorous yet reverant, approachable yet profound — could well bring many lapsed Catholics and other lost souls into the fold. So, I took the liberty of e-mailing a few of my friends, sending links to my favorite posts, as well as the January 4th post on the Weblog Awards, along with a subtle (OK, it wasn’t the least bit subtle) suggestion that they cast a vote (or two, or three) for our favorite religious blog. So, fellow Conversion Diary readers, since pretty much everybody in the world has a larger e-mail address book than I, consider spreading the word! I just have a sec to comment but just wanted to say thank you to Tres Angelas for your kind words about the awards. You are so sweet! And thank you to everyone else as well for your kind words and birthday wishes! I voted for you Jen!!! Even after I clicked thru on Fr. Dwight’s blog. Shhh, don’t tell him. I do so enjoy the glimpses into everyone’s lives! That IS awesome. Truly awesome. Thanks again for hosting such a fun Mr. Linky! Sorry I can’t play today, but I’ve sure enjoyed yours! Have a happy birthday weekend. Regarding #1, congrats on getting so close to the top! I’ve been having arguments with myself lately about what blogging success looks like and what I should be striving for. I’m nowhere close to a Weblog Award, but I do pay too much attention to numbers–how many visits, how many comments, etc. I just wrote a blog post on the topic, after reading about a small church with a big impact, and being really inspired and humbled. I’m trying to keep it all in perspective, while at the same time wanting to share my understanding of God with as many people as possible. It’s a balancing act! i REALLY love that last picture. my boys would probably want that painted as a mural on their wall. thanks for doing this whole thing. i always read, but this week i think i’ll actually participate! P.S. Had to go tend to the kids before I had a chance to wish you a happy birthday!!! I think the going out (e.g. to daily mass) is for some personalities the perfect “break” in the day to reset to brain and spirit. Add that you’re focusing (in heart at least) on “things above” and it seems hard to go wrong. Kudos for “getting out,” I’m still working on that… maybe we’ll try for McD’s Playland… far less spiritual, but more running around involved and that’s good too. 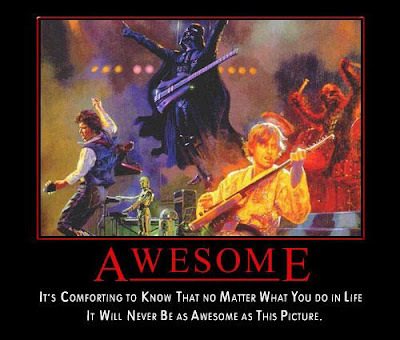 That picture is, indeed, utterly awesome. 50 folks already! Wow – you have started quite a sensation with the quick takes. And it’s great. Thanks again. Ok, that picture IS really awesome. LOL Caused quite a stir around here. Um…hilarious! As I read #7, my husband is in the living room watching Star Wars on Spike. Awesome! Oh and a very happy birthday to you! I came across your blog browsing religious blogs but I noticed what you said about wondering how the pictures of the juicy meat get to be the amorphous kibble in a bag of cat food? Good question! 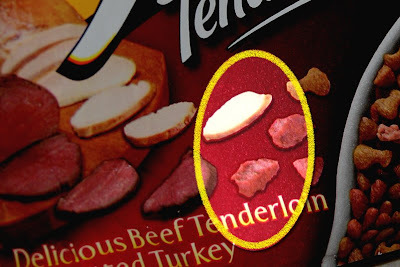 The truth is it almost certainly does not come from meat that looks anything like the images of high quality meat shown on packages. In fact it may be from sources we’d rather not think about. (but one piece of kibble is not likely to do any harm to a curious human “kitten”) But for a cat eating it as a regular diet, there are potential problems. Cats are “obligate carnivores”, made to run on animal-sourced protein and fat. Almost all dry kibble cat food has WAY more carbs than a cat’s body is meant to handle. I finally learned about feline nutrition when my cat became diabetic, probably partly due to years of a high carb diet. If you are curious about what cats need to eat — and have a few minutes between all your responsibilities to your 2 legged kids 🙂 — check out the site of veterinarian Dr. Lisa Pierson, at http://www.catinfo.org. I can just post random, unrelated comments, right? The votes won’t be tallied until tomorrow, of course, but it looks like I received more votes for Best Humor Blog than anybody except a couple of other guys. Woo-hoo! Thank you to everyone who voted for me, and congratulations to Josh at The Comics Curmudgeon for the commanding win. He’s a funny guy. No, no. No, no. Hold on. I understand that you’re disappointed. You worked hard for what you believe in, and I am deeply indebted to you. But this is no time for recriminations. It’s time for all Americans to put aside our differences and work together. Only by uniting can we build better humor blogs for our children and our children’s children. As for our children’s children’s children, I haven’t really had much time to think about them, but I’m sure they’ll figure something out. When you are in uncomfortable position and have got no money to move out from that, you will need to receive the business loans. Just because it would aid you for sure. I take consolidation loans every time I need and feel great because of this.